Times are changing. The authoritative boss Dr. Brock is replaced by team-supervisor Martin. But does this really change anything for the staff? And how does the attractive head-secretary handle the new situation? Olaf Encke was born in 1966 in Heidelberg. He began his studies in Animation at the "Konrad Wolf" Academy of Film & Television (HFF/B) in 1997. 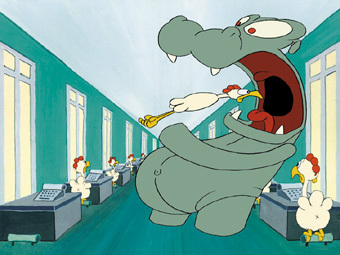 Cluck Cluck (Gack Gack, 2002) is his first animation film.